I’ve been testing a lot of patterns lately 🙂 I love pattern testing and every time I see a testing call come up, I just have to apply! Sometimes, I have to remind myself not to apply to every single one, since time is a valuable commodity. But anyway…. 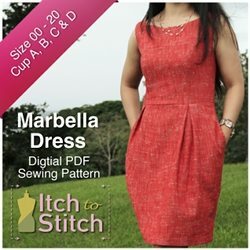 When the call went up for the Eloise Dress from Bubby and Me Creations (who test sewed the Queen Street Dress for me recently here), I just absolutely knew that I had to test! The dress is PERFECT! The details that she put into the pattern are so charming. I particularly love the pleats, which are on both the front and back. And the yoke would be a great place to switch up the fabric to really make it really pop. I’m doing that on my second version, which I have already cut. The instructions are clear and detailed and contain very professionally taken photos to go along with each step! On this version, I cut the size 1 (US size 12-18m) based off the chest measurement and the fit in the chest is perfect! It has just the right amount of room to grow. You can get more information about the dress pattern here.